With a winning mix of no-nonsense design, uncompromising off-road performance, and ultimate capability, the 2019 Jeep Wrangler is the only vehicle that will do when you want a Wrangler. That’s because there’s nothing else on the road like a Wrangler, as Jeep’s worldwide legions of fans can attest. Want to buy a 2019 Jeep Wrangler in Rogers, Arkansas? 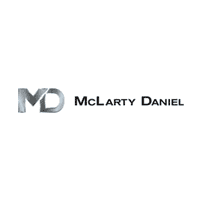 Then stop in today at McLarty Daniel Chrysler Dodge Jeep Ram Fiat in Springdale, or check out our great selection of 2019 Jeep Wrangler models online right now. CLASSIC DESIGN: The all-new 2019 Jeep Wrangler JL builds on the classic Jeep lines that trace their lineage all the way back to the scrappy little Jeeps that helped the Allies win World War II. Up front, the classic seven-slot, keystone-shaped grille has been subtly tweaked over the previous model, with wider grille slots and a grill shell that’s slightly leaned back for better aerodynamics. A wider beltline than ever before gives the 2019 Jeep Wrangler JL a grounded, sure footed stance, while features like easily-removable roof and doors and an industry-exclusive lay-down windshield invite you to seek adventure with the wind in your hair. LEGENDARY PERFORMANCE: Jeep has long been about unstoppable, reliable performance, and that continues with the 2019 Jeep Wrangler. Standard power is the legendarily reliable 3.6-liter Pentastar V6, with up to 285 horsepower and 260 lb.-ft of torque, for maximum towing of up to 3,500 pounds while maintaining highway mileage of 25 miles per gallon. Need more get up and go? Then check out the all-new 2.0-liter Direct Injection Turbo four cylinder. Designed from the start to provide enhanced low-end torque while maintaining unbeatable fuel economy, the engine delivers 270 horsepower and up to 295 lb.-ft. of trail-clawing torque, while delivering the the same 25 miles per gallon as the Pentastar V6. UNSTOPPABLE OFF-ROAD CAPABILITY: The world over, in most any language, the name “Jeep” is synonymous with unparalleled off-road capability. That reputation gets pushed up another notch with the 2019 Jeep Wrangler JL. 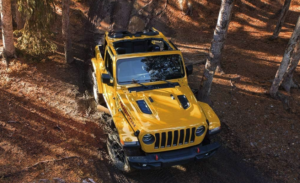 The unstoppable 2019 Jeep Wrangler Rubicon features a host of bombproof suspension and drivetrain components, including steel bumpers, rock rails, 33 inch all-terrain tires and the incredible Rock-Trac 4×4 system, Built around the clawhammer-tough NV241 transfer case with a 4-to-1 low range gear ratio, the package features Tru-Lok electronic locking front and rear differentials and the exclusive electronic front and rear swaybar disconnect, for boulder-conquering suspension articulation at the flip of a switch. Are you ready to buy a 2019 Jeep Wrangler in Fayetteville, Arkansas? Of course you are! Who can say no to the hands-down most capable 4×4 on the road today? The next step is to come see us at McLarty Daniel CDJRF of Springdale, and take a test drive today of the unstoppable 2019 Jeep Wrangler! Whether you choose the shorty two door or the capable four door, a new 2019 Jeep Wrangler can help you get out there and find adventure far past where the pavement and street lights end. Come see us soon, or check out our big selection of 2019 Jeep Wrangler models online right now!